We’ll Show You How To Plug Into the Power of the World’s Most Popular Search Engine! Google Books: you won’t believe what you can find online! Google News: their news archives can boost your research! Google Earth: we help you to zoom in on your family history! Google Alerts: search terms at the click of a button! Google Scholar: yet another way to trace your ancestor! Digging Deeper with Google; Dan Lynch describes some advanced features of this popular search engine. Genealogical Googling; Dan Lynch tells us how to get the most out of this important search engine. Google: the Hits Keep On Comin’; Dan Lynch looks at the latest innovations form everybody’s favorite search engine and how it can benefit your genealogy research. Google Scholar; according to Arnon Hershkovitz Ph.D, your ancestors’ academic papers can be a boon to your research! LIFE Magazine Photo Archive Online; David A. Norris Looks a LIFE Magazine’s online archive. 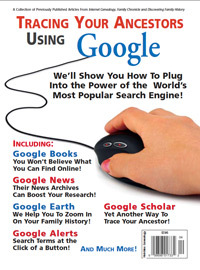 Googling for Genealogy; Marian Press reveals some of the secrets of Google. Googling Helps Your Genealogy Go Global; Dan Lynch shows you how to zoom in on your family history. Delve Into the Past with Google; Marina Garrison documents the benefits of Google’s latest addition. Google: The Dot-Com Gift That Keeps Giving! Dan Lynch shows you how to Google your family tree. What’s In Your Google Toolbox? Diane L. Richard looks at a great book from Lisa Louise Cooke. Google’s Archives: News You Can Use! Lisa A. Alzo shares five ways to find your family in this great genealogical resource. Create Custom Google Maps; Bill Puller Shows you how to customize the ‘net’s most popular search engine!